This veggie side dish with mushrooms is simply awesome with the peppery aroma and flavor. Like pepper chicken and lamb pepper recipes this is something very delicious which pairs best with chapathi and steamed rice. A pack of mushroom is just enough for a delectable lunch meal. Still, some people don't know the drooling taste of mushroom. 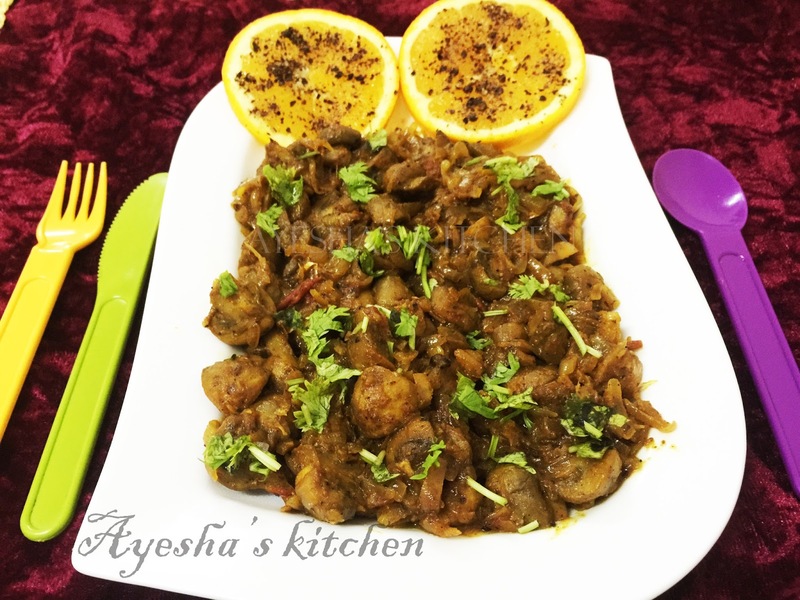 To all those chicken lovers, here is the substitution for pepper chicken ..You must try this recipe or any of spicy mushroom recipes and am sure you will want this more. Here is the recipe for vegetarian side dish/side dish for chapati / healthy lunch ideas / healthy vegan side dishes. Cook the sliced mushroom with coriander powder, soy sauce, ginger garlic paste, and salt. Add required water too. Cook till the water evaporates and keep it aside. Now take a non-stick pan and heat oil. Add the sliced onion and saute until golden. Put tomato and mix well. Cook with the lid closed. When the tomato becomes mushy and oil floats on the top, add turmeric powder and the cooked mushroom. Add required salt and pepper powder and again cook for few minutes. Garnish with coriander leaves. SERVE ALONG WITH CHAPATI OR STEAMED RICE.